Writing my blog has become to me more than just a baking blog. I sometimes have shared what is going on with my life and my feelings. Sometimes my friends have been a part my blog and have shared a little of their lives and a story. If you’ve been following me this past year, you may have taken the time to read some of the incredible Food Memory stories that have been shared here on Savoring Italy. Food Memory came about after I posted about losing my dad last January. Friends reached out to me with words of encouragement and even shared a little bit of stories of those that they loved and lost. That’s the main reason I started the Food Memory series: Keeping their memory alive in our hearts. I’m so excited to share with you my sweet friend Nancy. Nancy writes about when she first found my blog with my Sweet Orange Buns post. I honestly felt as if I had known Nancy much longer than that. She is not only a fabulous baker but also quite the story teller. I always get really happy when Nancy posts one of her layer cake creations. I LOVE to bake layers cakes and sadly, haven’t had much time to bake and share them here. So I dream of baking every, single layer cake that Nancy creates. One of my favorite recipes of Nancy’s is her Lemon Faux Napolean Cake. 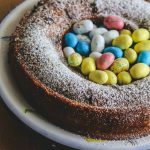 Here is her simple and lovely Sour Cream Coffee Cake (I love this post because she also talks a little about her sour mood…we all have those days and I could totally relate to this post!). If you haven’t noticed, I love her cakes! My other absolute favorite is her Orange Sour Cream Cake. If you haven’t come across her blog yet, please pass by and check out her incredible baking and you will also be pleasantly surprised with her charm and wit in each story she creates. Hi, everyone! I’m Nancy from Gotta Get Baked. I don’t know how I stumbled across Lora’s beautiful blog but I’m thankful that I did. The very first post that I read of hers was titled Sweet Orange Buns, written very shortly after the passing of her father. Can you imagine a more intense, serious, sad post to start with? While the orange buns that Lora made were indeed delicious (as is everything that she makes), the food wasn’t what captured my attention. This was a heart-wrenching ode to her father, a post full of memories she had of this incredible man and her feelings in the wake of his passing. It was about traveling to his hometown of Sicily and reconnecting with family members. 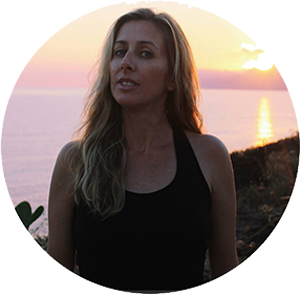 It was about sharing photos from that journey and using her blog to make sense of everything, to mourn, to heal. I was hooked. I was intrigued. And I wanted to get to know the woman behind the beautiful, haunting words that had driven me to tears as I read them. Fast forward 12 months later and I’m honored and privileged to be contributing to Lora’s Food Memory series. Lora is an incredibly sweet, genuine and talented woman. I’m constantly in awe of her baked goods (she is seriously the queen of bundts!) but more importantly, I’m lucky to call her a friend. I’ve been to many funerals in my life. Death came to some who had lived a long, full life. Others were taken far too soon. My high school counselor, Ms. D as we lovingly called her, passed away from cancer a few years after I graduated. It was devastating. I remember attending a memorial in her honor at the high school auditorium, looking around and seeing all of my classmates. We were beside ourselves. The weight of our sadness and the cruelty of our loss were heavy and thick in the air. Ms. D kept me sane during the four tumultuous years that she was my counselor. She had an open door policy – if you ever needed her, you could walk right in. She was my shoulder to cry on, my constant source of support. She was more a parent to me than my own were in those dark days of raging hormones, intense self doubt and torturous self-discovery. She never judged. She always had time for me. She truly guided me through what seemed at the time insurmountable levels of stress, doubt and sadness. I think of her every now and then. I miss her. I wish she were still with us, so that I could go back to that place of love and comfort and tell her that, because of her, I’m doing pretty good. I wish I could have one of her hugs. You know the kind, where you’re completely enveloped in warmth and softness and when you’re receiving it, you feel in your gut that everything’s going to be ok.
My dad thought I was a total screw up in high school. My grades were bad. I was never at home. I stayed up all hours of the night. I never listened to anything he said to me. He hated how I dressed. I spent so much time in extracurricular activities, like show choir and dance class, that he actually went to the school and tried to pull me out of all my fine arts classes. He met with Ms. D. and she, being the miracle worker that she was, actually talked him out of doing that. I don’t have a specific food memory for Ms. D but I wanted to honor her, because she is one of the most important people to leave my life. She was so proud of us, “my kids” as she called us. She had a huge cork board on her wall where she kept all of our photos. You’d see yourself grow up on that board, with new photos replacing the old every year. She always knew what was happening with each of her students. I was so proud to have her for my counselor because she was the best. 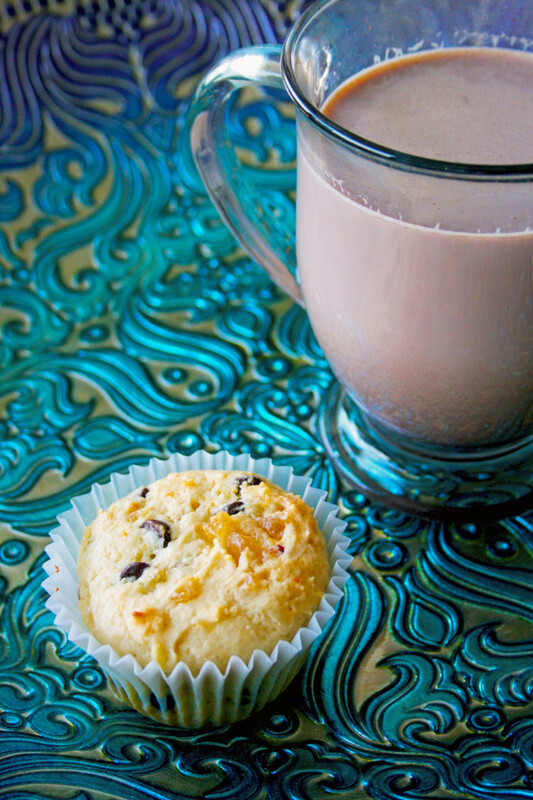 Muffins and hot chocolate are synonymous with my high school years. It was what the BFF and I would eat every day, after running down to the cafeteria during the morning break. So in remembrance of Ms. D. and the tumultuous high school years that she guided me through, I’m making her muffins. To be washed down with a giant mug of hot chocolate, of course. Funny coincidence – I had forgotten that Lora made orange buns in that first post of hers that I had read. It was totally by accident that I also chose to feature the flavor orange in my guest post! I wanted the orange to shine so I didn’t pack the muffins with the add-ons. Because candied ginger, dried cranberries and chocolate are so delicious, feel free to increase the amounts from those I used below. 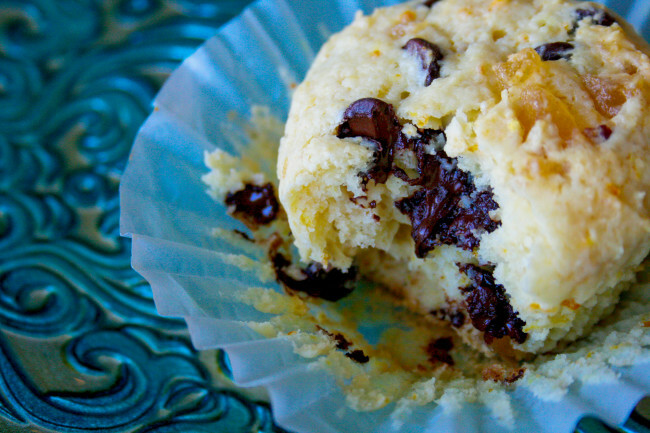 Nancy’s notes on the muffins: These are super moist and delicious. I’m so pleased with how well the orange, cranberry, ginger and chocolate flavors meld together. It’s different but highly addictive. I gobbled two down immediately after they were baked and had to stop myself from eating more! Lora, thank you so much for having me! Thank you, Nancy, for sharing this special post about Ms. D. Thank you for sharing these delicious muffins in honor of Ms. D with all of us. Other #FoodMemory Guest posts to check out. Preheat the oven to 350 degrees F. Place paper liners in a muffin tin or, if not using liners, grease the cups of the muffin tin. Combine the flour, baking powder, salt and ground ginger in a medium bowl. Set aside. In a large bowl, whisk the egg for about 20 seconds. Add the sugar and whisk until fully combined. Stir in the orange zest. Whisk in the coconut oil until fully combined. Add the sour cream and whisk until fully combined. Add the flour to the sour cream mixture and fold with a spatula until the batter comes together. It will be very thick. Add the cranberries, candied ginger and chocolate chips – fold together until the ingredients are evenly distributed. Don’t over mix the batter. Using a large spoon or ice cream scoop (I used the latter) evenly divide the batter between the cups of a muffin pan. I had leftover batter, which yielded me another four muffins for 16 in total. Bake for 20-25 minutes, or until the muffins are a light golden brown and a cake tester comes out clean. 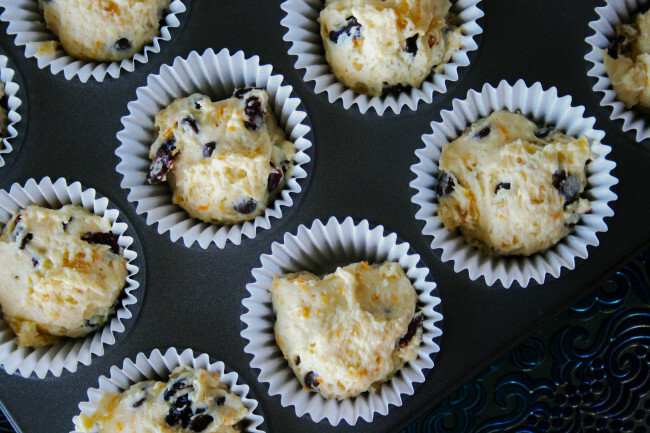 Place the muffins on a rack to cool or eat ‘em fresh ‘n hot out of the oven! I really really love this series. . so special. . such wonderful stories and I really think people are being celebrated and remembered here in such a beautiful way. Nancy, what a beautiful post. . I love that you had someone special like this in your life that was not in your family. . reading stories like this make me appreciate individuals who work at schools so much. Building up, encouraging, strengthening our children. . I love this so much and hope that if phoebe and madeline ever need someone else, outside of me and paul, that they may find this in a teacher or counselor, like you. thanks so much for sharing this. loved it so much! and the muffins are glorious! 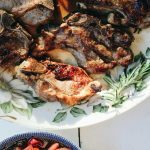 Lovely recipe and truly heartfelt post. It is so wonderful to see my blogging buddies coming together to share the moments about people who shaped our lives. Those muffins sound and look fantastic with the combination of flavours. Thanks for sharing, Nancy. I'm sorry for the loss of your father. It must be tough a year later to have the memories of his passing resurface. But this is indeed a great series you're doing here honoring those who've lost someone special. On a lighter note, I love layered cakes!! I've made several in my past and for me decorating is always my favorite part. Cool name for the blog; it suites you well! And hey Nance! These muffins look tasty. I actually really-really enjoy cranberries with orange! It's one of my favorite flavors combinations. And you know me, throwing chocolate into the mix makes it all the better! Oh, love the serendipity of the orange coincidence, too…Both recipes are undoubtedly divine! I agree, my dear. Thank you for your sweet comment, Kim! Hi Connie-Thank you so much! It has been lovely sharing the posts of these talented women in this Food Memory series. Layered cakes are wonderful:) Thanks for your sweet comment. Thank you for stopping by, Wendy! I appreciate your lovely comment. Yes, food cooked with a loved one in mind tastes better because of LOVE! I agree that this is a lovely and heartfelt post. Thanks so much for your support, Renee! Awww-thanks so much, Alice. I love this series as well. 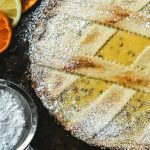 Nancy shared a beautiful post and recipe and I appreciate your support! Thanks, Betsy! Happy you are enjoying this series. Thanks for your support! Hi Lora! I found you from Nancy's blog. Such a beautiful post and I enjoyed reading both of your stories. Such a sweet honor to bake and be reminded of loved ones. I always think of my mother when I bake or cook in the kitchen, because all growing up, she practically lived in the kitchen. She cooked us dinner 7 days a week and never had us eating boxed food or fast food. She always made sure we were well fed. She wasn't much of a baker and never wrote her own recipes as I do for my blog, but she did and still does have a huge passion for cooking and I know that was passed to me. I know it will come even more alive whenever she is no longer here. My daughter is 2 and she already loves to be in the kitchen with me. I love the memories I'm making with her! Thank you for sharing! Oh Nance, I love how you tell your personal story! And you went on and became a lawyer, in spite of those tumultuous years. You're such a wonderful person my friend. 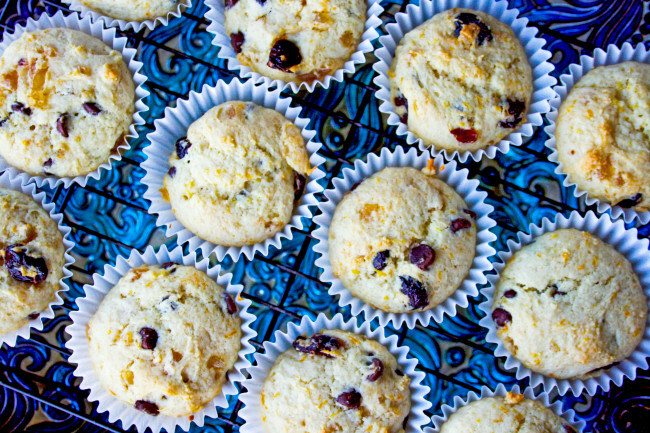 These muffins are gorgeous, and all those add-ins! I love all the ingredients. Great guest post for Lora! This is such a wonderful idea for a series. I'm so happy I found your blog. Recipes are just so much more special when they're tied to the ones we love. I've always felt like being in the kitchen connected me to more than just food. Thanks for sharing your story and giving an opportunity to others to share as well. I look forward to following along in the future. 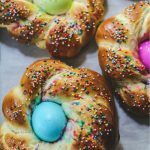 Delicious recipe and wonderful post. Good for me too as a reminder of my own teen and how I hope I can be their for her with support and love and without judgement. God bless your Ms. D for helping you to navigate to the other side!